Green Bean Day T-shirts on sale now! It is almost time to get those green bean seeds into the ground! Here is your chance to dress for success with your very own Green Bean Celebration T-shirt. The shirts are $15 each for size youth small through adult extra-large. Sizes 2X through 5X are $20 each. You can place your order at the Buckhannon Welcome Center on Main Street or contact a committee member at the information noted below. Proceeds from the T-shirt drive go to purchase green beans for the Parish House. The Annual Green Bean Celebration is a grass-roots effort to promote volunteerism, healthy nutrition, agriculture, and to help stock the Parish House pantry with fresh green beans. The 2018 Green Bean Stroll/Walk is August 11th. Please consider planting extra green beans in your summer garden to donate to the Parish House and help stamp out hunger in our community. 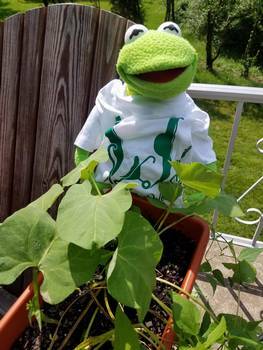 To order your t-shirts, get more information about Green Bean Day, or to tell us about your project to gather green beans for the Parish House, please call Dr. Joseph Reed at 304-472-2146 or Maria Bray at 304-997-5110, send an email to GreenBeanDay@hotmail.com or mail your order to Green Bean Celebration P.O. Box 181, Buckhannon, WV 26201.